For someone who ran a successful orthodontics business for nearly two decades, Seattle-based jazz singer Gail Pettis sure can swing. Only on her second release, Pettis bebops her way though a wide range of emotions and skilled melodic paraphrasing that some jazz singers have taken decades to realize. 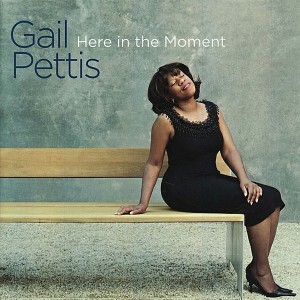 Even though, Here In The Moment is a collection of jazz standards it is Pettis’ unique interpretations that make it such a wonder to hear. Under the guidance of Seattle’s creative giants; Pettis’ opens with one of two Cole Porter tunes; “In The Still Of The Night” bounces and sways as Darin Clendenin’s (piano) and Clipper Anderson’s (bass) solos breeze into Pettis’ playful vocals. The second Porter track, “Night And Day” is pulled into twilight as a mysterious shadow is brought on by pianist Randy Halberstadt, in the background the band plays on as if they have had one too many drinks – but it’s these moments that sweep you into the groove. Other choice cuts include the tender piano-vocal duet, “I Thought Of You” which brings to mind lone taxi rides home, while the gossip chatter of “How Did He Look?” will surely bring a smile to the ladies.